The song is "You Can't Tell Me Nothing", and the video with Zach Galifianakis is a lot more fun than the original. 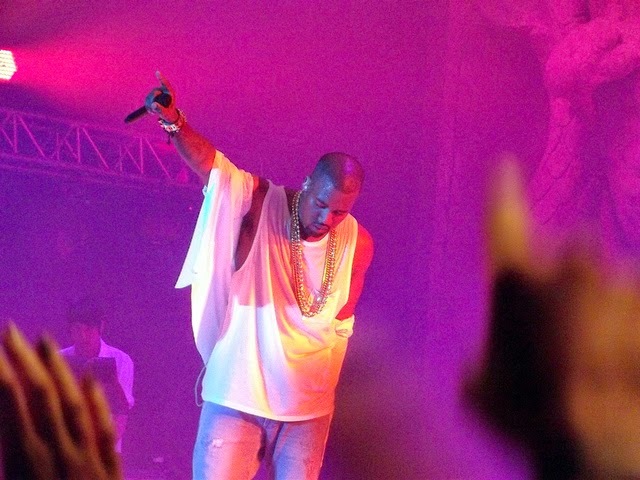 In the first verse, Kanye talks about some of the problems he has with money. Right after a dream in which he thinks he can buy his way to heaven, he wakes up and spends that money on a necklace. When Kanye feels the pressure of success and fame, he makes financial decisions he calls "stupid": buying more jewelry, more Louis V. His problems with over-valuing luxury items are common in poor communities. And he attributes these misconceptions to his background: he's not one of the Cosby's, after all, whose children go to Hillman College. And he thinks it's natural that these problems still persist after he became wealthy. Why would we expect money to change all his habits, financial or otherwise? Could money really make him forget where he came from? Kanye asks in the chorus: "Wait 'till I get my money right - then you can't tell me nothing, right?" But my take is that Kanye knows that simply getting his money right, being wealthy, doesn't prevent him from making bad decisions or being above criticism. You can tell him something. And while I'm sure I had a very different upbringing than Kanye West, I think we all carry some of our family's attitudes towards money with us, for better or worse. For me, it's my mother's sense of frugality and food scarcity that I carry. She grew up poor in the Philippines, with nine brothers and sisters. Food was usually an issue. She has a bunch of sad stories from her childhood about there not being enough food to go around, like how they'd usually only have one little piece of meat to be shared with the entire family, and most of it went to her father, because he was the one working, and he needed the energy. Or when they were lucky enough to have sinigang (a sour Filipino soup made with pork or shrimp), sometimes my mother's aunts would come over, and all the kids would be sad because then they'd only get one shrimp instead of two. This mindset carried over to her household in the U.S., even though her financial situation now is incomprehensibly better than it was in Manila. Growing up, our freezer was packed with meat that she bought because it was on some crazy sale, and we always kept it on hand, just in case the hard times came and we needed to lean on the stockpile. The irony is that this often led to a lot of food waste, with forgotten items being thrown away, only to be replaced in the coming weeks with a new stockpile that was on some crazy sale. Lather, rinse, repeat. And now I carry on the tradition. I notice that I have the same tendency to stockpile food and buy way more than we need. Like my mother, I'm particularly susceptible to a good deal on meat. It's oddly comforting for me to keep a lot of extra food around, just in case. The rub is that I've never been hungry a day in my life and, at least by global standards, we're insultingly wealthy. There is very little chance that I will ever go hungry so long as there is food to be bought in a store. Nonetheless, I have enough meat packed in freezer bags and dry goods in the pantry to feed us for months. And despite this plenty, I will still go food shopping a couple times this week to snap up more deals. You can bet that if I see pork chops on sale, I will find room in the freezer for them. Our growing wealth doesn't seem likely to change these things about me. My money's right, but you definitely can tell me something, readers. It's like Kanye's desire for luxury goods he can display, or the millionaire next door who keeps on changing his own oil or sewing patches on his torn jeans, well after there is no longer a financial need to do so. Unless something changes, I will probably keep fending off a food scarcity that I've never actually known. On our collective path to better finances, I wonder if my fellow travelers have these persistent financial quirks, too. Are there things from your family's past that hang around in your financial present? *Photo is from DrabikPany at Flickr Creative Commons. My mom was always borderline hoarder (and it's only gotten worse after the kids have moved out of the house - think formal dining room converted to 2nd storage/crap room), and it's always been something that my sister and I have to consciously fight since we know the chaos it causes to live in it (but who can turn down a free race shirt!). So I try to say no more than yes when it comes to bringing things into the house, because I know it's much easier for me to turn it down up front than to give something away once it's already been home and "ours" for a while. Thanks for sharing that, Mrs. Pop. We have some of those tendencies in our family, too. The same instinct that causes us to be frugal can nudge us to keep from throwing anything of value away. It comes from a good place, I think. I hear ya on the food thing, DB40. As we did struggle for food at times when I was a child, it's a bit of a fear of mine about feeding our own kids. We always have a few extra bags of rice/noodles/beans or whatever laying around, just so I know we have something to feed them if stuff really gets bad. Great post, my friend. Thank you, Laurie. I hesitate for us to necessarily call it a 'bad' thing because, I mean, better safe than sorry with food, right? But it's hard for me to tell where 'too far' is, too. I just had a serious revelation here! My mom grew up poor- they had 7 kids in a two bedroom house. She had to share a bed with her two sisters growing up, and only had a drawer in a dresser to keep her belongings. She has always kept things that other people would throw away- same thing with food. She stockpiles food and condiments like World War III is coming. I wonder if those two things are related. My mom has those exact same tendencies, too, Holly. She has a big tupperware with condiments from fast food places in it. Habits die hard. Nice Post. As someone who grew up in and out of poverty I always find it interesting how people react in such different ways to a financially challenged upbringing. I know people who react in a Kanye way. They spend way too much on clothes and cars and stuff because the felt "deprived" and "envious" when they were growing up. Others treat money like a security blanket and never let it go. I thought about some of your posts when writing this, Charles. I wonder if there are some common financial tendencies from people who grew up wealthy, too, that end up being problematic going forward. Might be thinking of a different blog. Name's not Charles, although the alliterative value of that name would be awesome. Crap. Sorry, Chattanooga Cheapster. It was very early when I was reading and commenting, prior to coffee. My bad! I'll try to skip the part about how much I loathe Kanye. :) It's kind of a hard question for me to answer because I really don't know. My parents could not be any different from each other as my mom buries her head in the sand about money, and my dad has always been great with it (they are divorced), so I feel like I fall somewhere in the middle. I wish I had landed more on my dad's side because I remember him going to investment club meetings, and just being great in general with that kind of stuff. The only thing I'd say I'd never do (which won't be a problem because I don't have kids) is to enable children. They both did that with my brother and I see the destruction that can come out of it. I hear you, Tonya. That sort of enabling behavior, even though it comes from a good place, does a lot of harm. As always, I love delving into the psychology with money. I definitely take after my parents' frugal mindset, even though my family's financial past is much different from my current financial reality. Sometimes it is very difficult to get rid of old habits. However, I have also seem people who grew up in poverty do a 180 when they start working and have a steady paycheck. They look at the old habits in shame and buy material items to show to others and themselves that they've made it. That's great that you take the best from your parents like that, Andrew. I know my frugality came from my mom, too -- I should have highlighted that more in the post. If some extra food is the price of that financial lesson, it's still a good deal. That's a good insight, C. I find that cash burns a hole in my pocket, too. I know there are studies showing that plastic causes more spending than cash, but it seems counter-intuititve to me. Weirdly, I carry more cash now than previously, but tell myself 'no plastic'. This helps me keep my weekly spend clearly visible in my wallet (and if it's empty, I can't enjoy a luxury, like eating out or a snack). However, I grew up with parents who to this day seldom seem to have cash, to the point it can be inconvenient... like for little things etc. So maybe I learnt the reverse habit? My grandma does the same thing with food. I don't know if she faced struggles growing up, but she could feed a small army with the amount of stuff in her pantry and freezer. It might also come from her desire to help others out, too. She always offered me food to take home if I needed it. Sadly, we had to start checking expiration dates on things! I have a tendency to hoard money because my parents never had enough. I'm so afraid of being unprepared for things like they were, but I have more than they ever did in the bank. My wife's the same way with money, EM, and has been since she was a kid. Her mom was the same, too. Once her parents gave her money to go to the carnival and, when she came back, she had all the money still. My wife's mother had just walked around the carnival and watched all the stuff, but spent no money. After that, they made sure she spent a little instead of saving it all. Great post - always wonderful to be able to learn some important lessons from music videos! Some great insights being drawn out on this post. I love that most of the traits being shared are positive ones from family. I think my family’s past had the opposite impact on me - they were absolutely terrible with money. Wasted it all on cigarettes, alcohol and general junk. They were pretty financially illiterate, and didn’t know what to do with it other than spend it. ‘We’re here for the good time, not for the long time’ was a favourite phrase I can recall. Unfortunately the ‘good times’ didn’t involve much time with family, as they just worked all the time to earn / spend (waste). This drove me to learn about investing and finance at a young age, to avoid ever being in this sort of situation. Frugality is a habit and mindset I definitely had to learn and practice over time. I guess old family financial habits have an impact on us one way or the other! That line about being here for the good time, not for the long time, that's a fantastic idea for a blog post, Jason. Maybe something more, like a book. It says a lot. My parents were wise with money and what I would consider frugal. Always shopping sales and auctions in particular. They also clothed us for the most part through second hand stores. I'm grateful for their provision and the wisdom they taught in how to handle money. However, I think I developed an aversion to used things. It's difficult for me to buy used. I figure if that's the only drawback of being raised frugally, that's a pretty sweet result, Brian. I love buying used but I can see how it could get old if you were over-exposed to it for years. Hearing stories like your wife's about food scarcity really puts life in perspective. There is definitely hunger here in the states, but most people don't think about it much. I think that something that stuck with me is my Dad's anxiety about money. It might be positive, though, because it really motivated me to learn about passive income, small business, etc. as he didn't pursue these things. I don't want to be tied solely to my salary, which I have little control over unless I switch jobs. That's a positive result, to be sure. I still don't properly value income diversification and a job loss would be devastating to our plans. I'm just now starting to diversify with rental properties. I need to learn from you, David, on how to monetize the blog someday. Want to coach me? I'm always in fear that I'm going to lose everything and end up back in the housing project. I'm always determined to grow my income and assets so that my family will never have to experience that. Great story about how your mother influenced your financial state. I was thinking of your posts, Charles, when writing this. I'm sure that your family will benefit immensely from the struggles you had early on. It's remarkable to me how the past sticks with us, almost regardless of what kind of financial present we create for ourselves. Huh, I hadn't heard that about the freezer. I guess that's the silver lining! My mom wasn't a depression baby, but she wasn't far off, either (born in 1945). Most of the items that are saved, kept, etc in the Even Steven household are clothing, like they "I can fit into that" or "I love that shirt, who cares if it has holes everywhere", since I sell used/gently used clothing on eBay, I chalk it up to storage for the side business. Ha! I hear you on Kanye...I have conflicted feelings about him. Still, Through the Wire is one of my favorite songs, so he'll get a pass from me. Like how Michael Jackson is blameless forever after making Thriller. Stuff from our childhood is tricky, since it's very hard to put a dollar value on memories. It also can have potential value for future family members -- real, but hard to quantify. I think the rub is when there's simply so much of it. If it's just a box or three, I think the sentimental value for you and your children/grandchildren might be worth the space in the closet. I grew up in a poor household. My mother, single from a divorce in the 60s, worked extra hard for us kids. We had a Coleman cooler for a refrigerator. Had to fill it with ice every few days. Ever since Kanye went up on stage and made a fool of himself in front of Taylor Swift, I have no respect for him. Yeah, it's tough to have a lot of respect for Kanye anymore. That detail with the cooler is intense, No Nonsense Landlord. And our kitchen table was the picnic table from the backyard, with a sheet on top of it. I should write a post on my blog about my humble beginnings. Your mom's story sounds a lot like my mom's. A lot of the poverty she went through definitely influenced how she treats stuff now. I really think my mom is a mini-hoarder, she just keeps accumulating stuff! But considering back in the day when she barely had anything, I understand a lot more why she does so. My mom has some of those same tendencies, too, Lisa. I'm probably not being understanding enough of her. Mmm, sinigang!! Even the thought of it makes me pucker like I just ate a lemon - though in a good way! My grandpa had the same story except with pork and beans, and he dreamed one day that he could have his own can of pork and beans. Growing up, we ate it at practically every meal. :) I tend to be a food hoarder, too, but it does go on rotation so we don't waste a lot at least! But it's definitely a ridiculous amount for 2 people. That pork and beans story is really telling, Anna. I can only imagine what it's like to have food aspirations like that: having my own can of beans. As usual, I need to just feel gratitude. My parents were/are useless with money and so was I until the age of 40. I had a very privileged upbringing until the age of 11, then it all went wrong. My Dad is an overspender who spends everything in his pocket and my Mum (who has a lot of money now), is a border line hoarder who shops all the time! I had no hope lol! Anyway I definitely followed their path. I stockpile food because in my teenage years my Dad would forgot to buy groceries and I never wanted my own kids to come home to empty cupboards. I had a family member on my dad's side who, when we visited, had absolutely no food in the house. It was weird as a kid...I remember asking the other kids in the house, "Um, when do we eat lunch?" We walked over to another family member's house for some sandwiches, which I think was their normal go-to. Anyway, I can see how having that experience in your childhood would swing the needle the other way with your own kids. Way better to have too much food in the house than not enough. Like you, I've never gone hungry a day in my life. Yet my parents both struggled for food growing up post WW2. My father came over from Ireland where he struggled for food often, generally eating potatoes to pack out main meals. Meat was scarce. My mum and her parents struggled for meat too and basics like sugar was rationed. My parents aren't wealthy now, but they eat really well. Most of their spare money goes on stockpiling food especially meat for their freezer. I actually don't stockpile like they do but lately I've definitely starting thinking more about trying to do so 'just in case'. I remember reading stories about the food rationing that happened in England around the war, Hayley. I can only imagine. Thanks for sharing that story. My folks lived through the Great Depression and were always ultra frugal. I picked up a lot of my habits from them. My wife picked up her frugal habits because her folks just never have had a lot of money. I think that's a common theme I'm seeing in the comments, Bryce. Our frugal bloggers had either grown up with out a lot of money, or had parents who did. Why does it seem that money, when you don't have it, is a problem. But how come it also becomes a problem when you have it...or too much of it, rather? I guess people will just have to tell people about money handling or mishandling for that matter and it is up to each person to choose rightly and be led towards the right path to better finances. You're right, Jen. There's no way of avoiding it...people have money issues. Or, rather, money doesn't solve our issues. Reading some more, I realise I've swung the other way with accomodation when travelling. My dad is pretty frugal with where we stay on vacations, but whilst I used to be OK with hostels, now I'm happier to creep in cost to stay somewhere nice. It helps I always 'halve' the cost in my mind and in reality with the BF too.. I did a similar post about this exact song two years ago. I was a bit harsher on Kanye because I feel he is influencing kids with his lyrics to spend on false luxuries hoping to better himself. In the end nothing money can buy will change you; change comes from growing and evolving as a person. Lol @ the Kanye hate. He truly is a douche, but he has made some excellent music that truly as some insightful meanings behind them. This was a great article that can go many different ways. I grew up African American and poor but eventually got out of the cycle, but I always find it interesting how others simply correlate the poor cycle to laziness. There are so many psychological issues and taught bad money behaviors that just don't away.